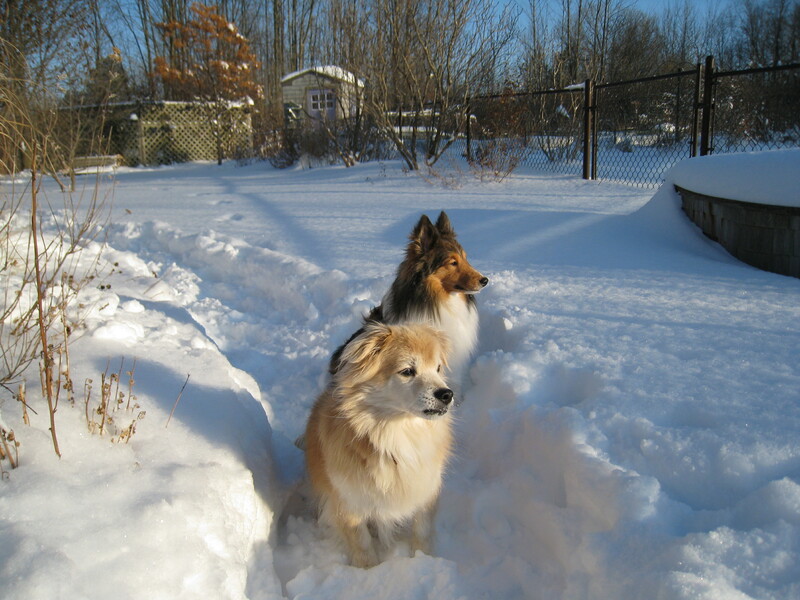 Teddy and Quinn pause on the shoveled path. Winter has come early to this part of western New York State and the snowfall has already been above average for this time of year. Temperatures have been abnormally low as well. I am accustomed to many years of snow but the first significant snow always manages to catch me off guard. The same seems true for the dogs. The first sign of snow and suddenly Quinn is reluctant to find a spot to eliminate. Lena might look out the door and pull her head back in, like a turtle disturbed by a child. Only Teddy seems to relish the snow. Maybe it’s his Tibetan roots. He rolls in it and will sit for long periods, nose in the air, while his body absorbs the falling snowflakes. Winter can present challenges for dog owners. Dogs with short fur, like Lena, or that are small, like Teddy or Quinn, can quickly become cold. Although Quinn has a magnificent heavy coat his paws are not so well covered. If the temperatures are below 15° F and there is snow on the ground he may spend only a few minutes outside before he sits down and lifts his front paws due to the cold. Dogs that have trouble in very cold temperatures need special care. While most toy dogs are not cold tolerant, size is not the only indicator. Dogs with low body mass, thin coats or very little fat fall into this category. Limit the time spent outdoors during the worst weather and be sure to accompany them outdoors to monitor their condition. Winter cold and snow often means less exercise for your dog. Dog coats and boots can help extend outdoor time for your dog to achieve the exercise he needs. Quality coats and boots that fit your dog’s needs are not easy to find. You may be able to find a variety of very silly inexpensive jackets, vests and coats at the local big box pet store. I say silly because your dog doesn’t care whether he/she looks like a biker or a princess. Sure, these might be fun, but they don’t necessarily help in truly cold weather. For warmth, select a coat with a filler or liner. The filler can be poly-fill or down and good liners include fleece, wool or Thinsulate. If you read coat reviews make sure that the reviewer lives in an area compatible with your climate. If I was picking a winter coat for myself I wouldn’t trust the review of someone who never experienced sub-zero temperatures where they live. It is important, especially in rainy or snowy parts of the world, to buy a coat with a water resistant outer layer. Coats made solely of polar fleece may get too wet and fleece is a magnet for dirt, leaves, burrs and all kinds of things. The coat should cover the chest and belly, the more coverage, the better. Coats that cover a dog’s rump can add more protection, but shouldn’t interfere with the tail or his ability to eliminate. Coats can always be used in layers that can easily change according to the daily temperature. The coat must be easy to use. If the coat is not easy to put on and take off you will be less likely to use it on your dog. The type of buckles and closures also play a role in your decision. Velcro is the easiest closure to work with. Too many buckles and snaps will slow down the process. Coats with legs on them are usually harder to put on, but can be worth the trouble for dogs with joint problems. Another part of use is how the dog moves in the garment. If the coat restricts movement then the dog might have trouble on stairs or slippery surfaces. Not all dog’s take readily to wearing a coat, be sure to give your dog time to get used to his. The right size is very important so measure your dog according to the specific manufacturer’s guidelines. Don’t rely on breed size. 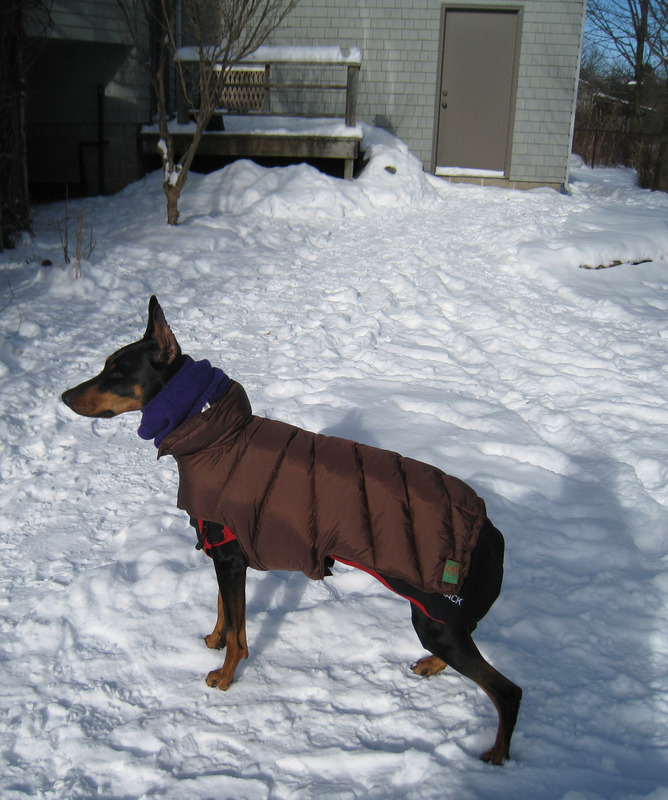 Lena is a very small Doberman and almost always needs a smaller coat than those recommended for her breed. A few coats to look at include: Obtrack Skrylle Dog Coat; Canine Styles Down Puffer Coat; K9 Topcoat’s Bodysuits and Kodiak and Puff-Doggy Thinsulate Coat. All of these coats cost between $60 and $200 full retail. If they are beyond your budget other options include layering 2 or more less expensive coats or making your own. Patterns are available from Butterick, McCall’s, Simplicity, and Kwiksew. If anyone has had great luck with other dog boots, let me know. When I was a child my father used his snow blower to create a path around the backyard for our Golden Retriever Heidi. I am sure the neighbors thought he was crazy but it really made it easier for her in the winter. I don’t own a snow blower but when the snow is deep enough I shovel a path around our backyard. It’s also important to keep the access clear to whatever door your dog uses. Remove ice on walkways, decks and porches to prevent falls. Be careful using anti-freeze in areas that your dog uses. Clean up any spills immediately and store it out of their reach. This is a deadly poison. Keep your dog away from frozen lakes, rivers, streams and ponds during the winter. This is particularly critical during periods of thaws. If they fall through the ice the chances of saving them are very slim. It is important for you to go outdoors to monitor your dog during very cold weather. And never leave them out for extended periods. It’s hard to get outside during really cold weather. Consider taking dog classes with your dog. Agility, obedience, freestyle, tracking or flyball are all fun activities that you and your dog might enjoy. This entry was posted in Care, dogs and tagged Dog, pets, winter. Bookmark the permalink. Because I have Chinese Cresteds, I’ve tried almost every style of dog coat over the years. It’s a real challenge to find coats that are warm, comfortable, and well fitting. During the winter, several of my old dogs need to wear clothes indoors as well as when they go out. So we use a lot of dog clothes around here. And many dog coats and sweaters chafe, bunch up, or don’t stay on very well. They also don’t hold up to repeated washing. Even expensive brands can’t handle regular washing. My solution has been to purchase used children’s tee shirts and sweatshirts at rummage sales. You can find sizes to fit almost every dog. They cost almost nothing, and you can wash them every day if needed. It takes no time to cut down the sleeves or add a Velcro tab for a better fit. These fabrics are great for layering and the seams are very soft because they have been washed and worn. Best of all, you won’t have a heart attack when you find two puppies playing tug-o-war with their clothes. When choosing dog coats it’s also important to consider your dog’s real coat. It’s amazing how often people overlook this detail. For most breeds, coat type is a big issue. These days, the media has fostered the idea that this is purely superficial, and dog breeders are mainly concerned with the aesthetic appeal of various coats. In my opinion, a good, harsh wire coat is unbeatable in most weather. It insulates, resists moisture, the dirt literally slides right off of it. Best of all, it stays neat and clean with almost no grooming. Unfortunately, most owners don’t maintain the natural properties of wire coats because they don’t understand how to do this. Groomers are most often guilty of ruining good wire coats by encouraging owners to clip them. A harsh, wiry coat inevitably becomes soft and fluffy after a few trims. It also loses its insulating qualities and it will soak up water (and dirt) like a wick. The same is true for harsh, stand off coats. They are designed to withstand subzero weather. But groomers either shave off the topcoat, or rake out the undercoat. In that case, even a Siberian Husky will need to wear a coat outdoors to keep warm. Another common mistake is assuming that long coats provide weather protection. They are generally a disadvantage in snow or rain because they attract moisture, and the dog is quickly chilled to the skin. These are the breeds that really need to wear coats outdoors, to repel water and maintain body heat. But they should wear a coat lined with a satiny fabric to prevent matting. I often see Maltese or Yorkies wearing knitted sweaters, and I am sure their owners can’t figure out why their dogs are always full of mats when the sweater comes off!